Designed for 4 players. Use the scenario distributions for fair play. Review by Teckmantle on 5/7/2013. Review by Nathan on 5/17/2013. Review by graze on 5/9/2013. Review by Novirtue on 6/11/2013. Review by Venador on 6/2/2013. 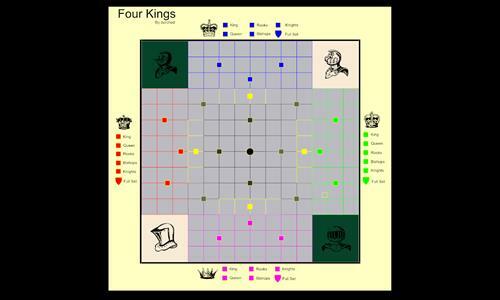 A good map which represents a 4-player chess board. Review by TitaniumFate on 9/12/2013. Review by otinanaimail on 3/16/2014. Review by Captain Carrot on 6/3/2013. Seems dull but very interesting and challenging. Review by G_GR on 12/26/2014. Review by sherron on 1/10/2015. I don't get why some territories can attack diagonal while others do or is it to avoid direct attacking between "courts." Review by Gunk on 1/16/2017.